2 tins of Sun Food pineapple. Mix the yolk, the sugar, the vanilla and cook them in baine-marine. Leave it to cool down. Mix the mascarpone with the sugar and add the egg mixture over it. Mix the cream with the mascarpone. Melt the sugar, add the butter. Pour the cream and mix. You can serve it: take 6 glasses. 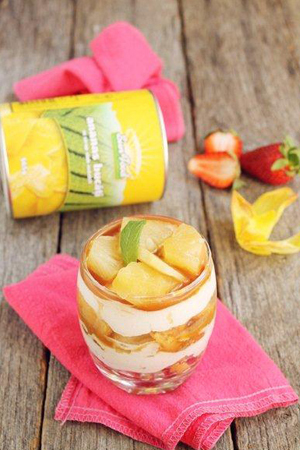 Put one cracker at the bottom of the glass, some pineapple pieces, some pineapple compote, a spoon of caramel, mascarpone cream, then repeat the same steps until you fill up each glass. Put them into the fridge for 40-60 min.